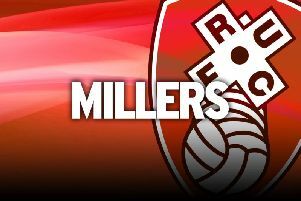 Rotherham United boss Paul Warne is considering shuffling his pack for Tuesday night's Carabao Cup clash with Wigan Athletic. And that could mean a welcome start for striker Jamie Proctor who has been missing for the last year with a serious knee injury. Proctor, 26, has featured in pre-season for the Millers but last played for the first team 12 months ago. “Hopefully I can Procs on the pitch, I’m looking forward to utilize him,” revealed Warne. “That will be great for him. “I don’t want to put too much pressure on the kid because he’s still ring-rusty and he will be for two or three games. “But it’s great for him and I hope he enjoys it. The ideal is that he scores, has a worldie [performance] and goes home in his car feeling great about himself. “The worse-case scenario is that he has a stinker and comes off after 45 minutes. The Millers have won just once in their last five meetings with the Latics, but go into the match boosted by a last-gasp 1-0 win over Ipswich Town on Saturday. But with the Championship Warne’s priority this season, Warne wants to cast his eye over the rest of his squad and see who impresses. “I will definitely take the opportunity to freshen things up,” revealed Warne. “I’d definitely consider changes, but in fairness if it was a league game I definitely consider changes. “You’ve got to look at your players and the way we play, which takes a lot out of them. “I’ll freshen up for Saturday [away to Leeds United] as well and it gives me the opportunity to look at different players. “It’s also a good opportunity for a lot of the lads on the periphery to show me what they can. On opponents Wigan, Warne added: “Whichever team he [Wigan boss Paul Cook] brings will be hugely competitive. “He's got a great squad. We know the style of play, but we don't know the personnel."